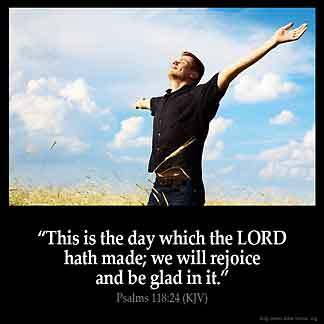 PSALMS 118:24 KJV "This [is] the day [which] the LORD hath made; we will rejoice and be glad in it." 21I will praise thee: for thou hast heard me, and art become my salvation. 22The stone which the builders refused is become the head stone of the corner. 23This is the LORD'S doing; it is marvellous in our eyes. 24This is the day which the LORD hath made; we will rejoice and be glad in it. 25Save now, I beseech thee, O LORD: O LORD, I beseech thee, send now prosperity. 26Blessed be he that cometh in the name of the LORD: we have blessed you out of the house of the LORD. 27God is the LORD, which hath shewed us light: bind the sacrifice with cords, even unto the horns of the altar. This is the day which the Lord hath made: we will reioyce, and be glad in it. This is the day that Jehovah hath made; we will rejoice and be glad in it. 118:24 Made - Or sanctified as a season never to be forgotten. How lucky we are to be given each day . This reminds us of that , and each day is very special . We are blessed ! This verse most likely pertains to the Jewish Sabbath. Written almost 3000 yrs.ago .Never the less,Christians can still rejoice,and be glad,when they think about Resurrection Sunday. I could not find, "This is the day which the LORD hath made " in my digital Bible and threw it out to the Internet and ended up on this page. You correctly identified it as Psalm 118 24 inThe Official King James Bible. But it was in modern English. Laughed, until I read alternate readings and you did use 1611 Middle English, which is almost unreadable to today 's readers. I was impressed with your page and will return.